Photo: One of our farmland staff tends to turkeys which are providing nutritious protein in our children’s diets and generating funds for our programs. 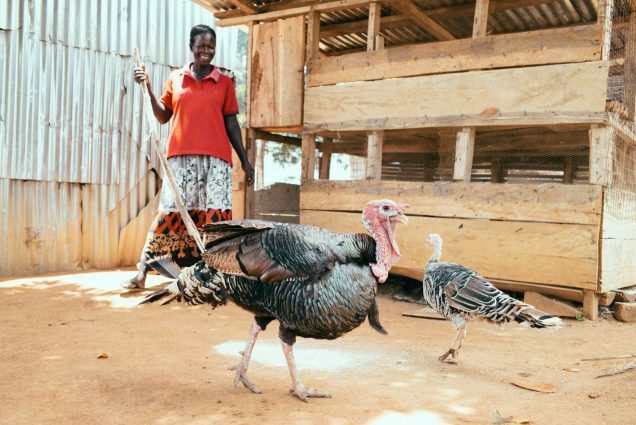 Our Uganda farmland enterprise has recently expanded to include a turkey house project which currently consists of 8 turkeys in 2 turkey houses. We are breeding the turkeys and expect them to multiply quickly. We are also raising a new breed of pigs called Landrace pigs. Their sows produce large litters of piglets with very good average daily gain and high lean meat content ideal for pork production which adds protein to the children’s diets. Our 5 cows are doing well, and they provide us with milk, beef, and income when they are sold. 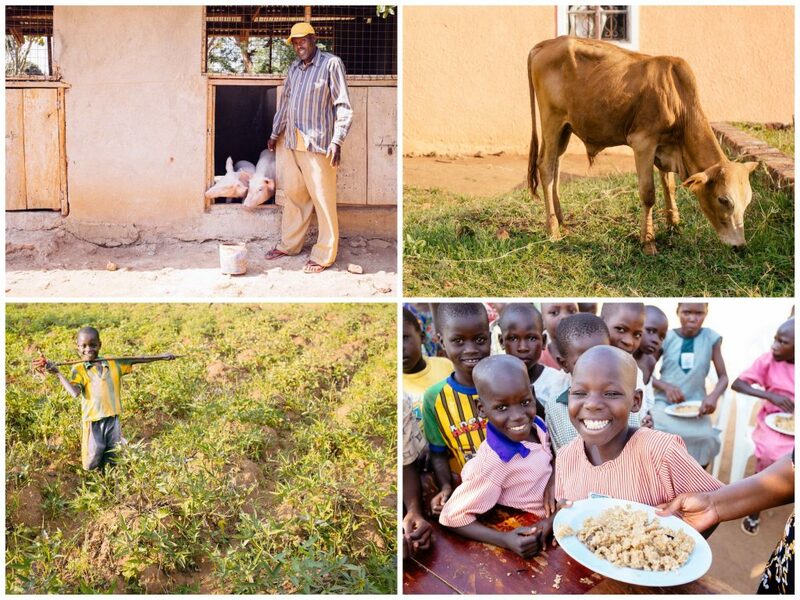 Thanks in large part to the farmland’s productivity, we are now able to serve approximately 25,000 fresh meals monthly to our students and orphans in Uganda. In addition to our livestock, our vegetable gardens and crops are flourishing. The rainy season has just started, which is timely as our planting season has also just begun. We have constructed nursery beds for growing onions, green peppers, eggplant, sukuma (similar to spinach), corn, beans, and potatoes. Along with harvesting these crops, our other plans for the farmland enterprise include rearing chickens for egg and meat production. This will be another good project for generating funds for our programs once we raise the starting capital. All of these efforts toward sustainability have been set into motion to support our education, medical, and orphan care programs in the region. In partnership with our local leadership, we operate three schools, two K-7 primary schools and one high school, serving about 450 children. We serve each of these children a fresh-cooked breakfast and lunch each school day. Produce from our farmland and garden projects help keep our pantries stocked with nutritious, organic ingredients. Among these students we have 51 orphans who need housing and family care. We provide them with living arrangements in a loving family environment. We take their care seriously and our leaders have made every effort to adopt them as their own children in many cases. A new orphan home was recently completed on our main campus with plans for a second wing to increase our ability to care properly for these children. Our hospital is not yet fully operational, so we’re still calling it a clinic for now. Once we can gain more profits from our farmland & garden enterprise, and/or raise more monthly sponsors to cover the staff needs at the clinic, then we hope to transition it into a true hospital. Almost everything else is in place for it to be a fully functional hospital. The clinic offers medical aid to local residents and their children. We have one full-time nurse who is licensed to administer first aid and medicines from our small-scale pharmacy. We hold seasonal medical camps at the clinic; in October we treated over 1,000 local residents in a 3 day period. We look forward to reporting back about the progress of our farmland and garden projects to care for our children in Uganda.